The Westcott Building on the Florida State University campus in Tallahassee. Nikon D700/28-300VR, 1/40s, f/25, ISO 200, EV +0.3, 34mm focal length. 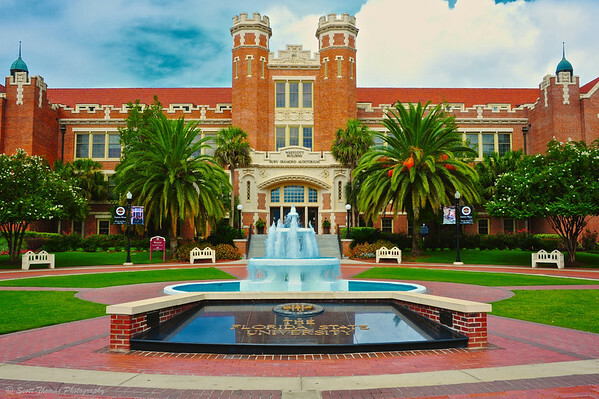 The historic collegiate gothic building was built in 1910 and served as then Florida State College’s administration building by which it was known until 1936. In that year the building was renamed the James D. Westcott, Jr. Memorial Building by then university president Edward Conradi in remembrance of the former Florida Supreme Court justice who had left a large part of his estate to the college. Today, it is the cornerstone of the Florida State University campus and is home to the Ruby Diamond Auditorium with seating for over 1,100 patrons. The Unconquered statue in front of the Doak Campbell Stadium on the Florida State University campus in Tallahassee. Nikon D700/28-300VR, 1/60s, f/18, ISO 200, EV 0, 78mm focal length. 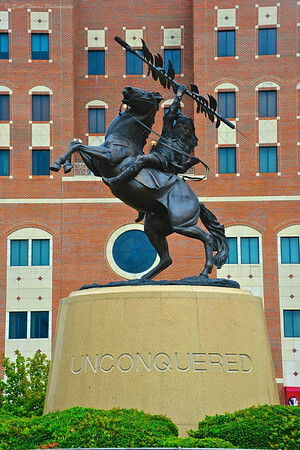 The mascot for Florida State University athletic teams is the Seminole Warrior beautifully shown in the statue named Unconquered which stands out in front of the Doak Campbell Stadium. The Seminole Tribe approves of the FSU mascot as it represents them with honor and respect. This entry was posted in Travel and tagged 28-300mm, bricks, building, doak campbell, florida, football, fountain, fsu, nikon D700, palm, red, seminole, stadium, state university, statue, tallahassee, trees, unconquered, vr, warrior, water, westcott. Bookmark the permalink. First shot at the top is really great.